Easy-Does-It was founded in February 2010 and was a hobby turned into a business as more and more friends wanted halters and training lines, rope reins etc. I am a one woman business and make all of the rope products to order, so please order in plenty of time if you need something urgently. Most of the time I can make and post within a day or two, but for large orders and in busy periods this is likely to take a little longer. Following on from the Natural Horsemanship products I introduced products for holistic forms of healing. This was after completing my Reiki Practitioner course and gaining diplomas in Crystal Healing and Crystal Healing for animals. I also achieved a diploma for Animal Healing, which involved Reiki, learning Animal Communication, Bach Flower Remedies, Crystal Healing, Essential Oils for animals, Colour Therapy and Animal Nutrition. I then did a Diploma course on Equine Psychology. 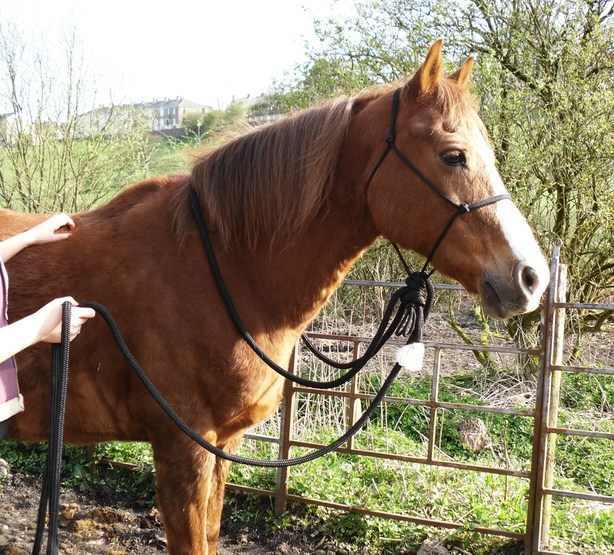 I felt that to sell the related products then I needed to know about them and to be able to offer advice to people wanting to use them for themselves or their horses and other animals. Crystals, Bach Flowers, Esential Oils etc can produce marvellous results but should never be used in place of veterinary care, but rather alongside that care. Pharmaceutical medicine will heal physical symptoms, but quite often those physical symptoms are related to the emotions and it is the emotional body that needs healing. Holistic forms of healing do this. The body should be treated and healed as a whole and not just based on the physical symptoms. The body has seven major energy centres, called Chakras. This applies to animals as well as humans. If these energy centres are out of balance or blocked then the body is not working to its full potential and physical symptoms may occur. If the energy centres (Chakras) are not working efficiently then the flow of energy through the body can stagnate, like that of a blocked or slowly moving river. Crystals are very efficient at rebalancing and unblocking the Chakras, enabling energy to flow freely again. Photo shows Natural Hackamore and 22ft mecate reins. Modelled by Milly. Slobber straps are made in England by a master leather worker from a quality tanned leather. They are a generous length of almost 9" when doubled. Carrot sticks are specially made for Easy-Does-It to be just as rigid and strong as the conventional stick, but lighter in weight. This is especially beneficial when used for ridden work.